This week would be week 4 after my right wrist injury. So far, the wrist pain has subsided significantly. I'm able to twist my right wrist a bit more. The pain occurs only when I turn my right wrist clockwise (as if turning a door knob). Also, as long as I don't push or pull at an odd angle, I've no problems with pushing or pulling heavy weights. The wrist also no longer gives me pain or discomfort when I sleep. It's been a bit annoying in the first 2 weeks because my sleep would always get interrupted. The ensuing pain wakes me up when my right wrist assumes a cumbersome position or if my body rests on it. After getting into this mode of getting back to fitness, it became hard to let a day go by without thinking about fitness. In fact, I've downloaded and watched a few bodybuilding videos during the first two weeks and those kept me more motivated. If you think I was absolutely in inertia during those three weeks of "rest", then you're mistaken. It's only my right wrist that was affected and so I was still able to do some other exercises. I still did cardio workouts. I quit exercising on the balance stepper though, for the time being. My left knee's tendinitis is acting up again and I suspect the balance stepper was aggravating the condition. Instead, I'm back to stationary running. It feels a bit strange though since I'm so used to using the balance stepper for aerobics and have not done stationary running for a long time. Using the same workout music I made for the balance stepper workouts helped me ease into this aerobic activity. On the strength training side, I managed to do a few weight lifting exercises on the third week. But I was selective on the exercises I could do. Any lifting exercise that stresses the wrist or puts it at an odd angle are out (Tricep Extensions, Skull Crushers). Ditto for exercises that require some sort of twisting motion by wrist (Arnold Presses, Dumbbell Curls). Essentially, it's the basic core exercises like squats, deadlifts, dumbbell row, etc. that were easier on the wrist. 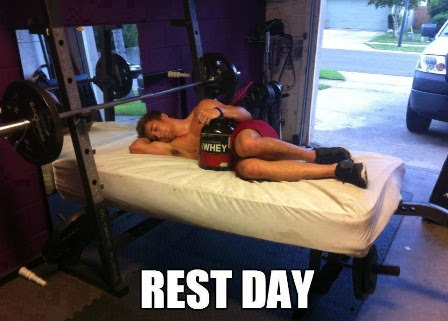 After strength training for a while, being away from the weights exercises to "rest" isn't a pleasurable experience at all. It's so quick to become impatient. The bodybuilding videos I watched kept me even more motivated. And wanting to lift, I attempted light lifting on the second week, but only to regret it. This is because it only resulted to more pain. And this just becomes counter productive in that the injury's healing is delayed even further. But most probably the biggest setback from the long layoff is the body readjusting again to the rigors of heavy lifting. The first time I performed squat exercises after the injury, it seemed so easy. But for the next three days, I could hardly walk well. My thighs, especially the inner thighs were so sore, I wondered what I did wrong. This episode though reminded me of a lesson in weight training and that is to keep exercises new. Although I was used to performing squats in the past, I was too comfortable doing them. The lesson is to tweak them a little, add more weight, do the exercise a bit different, add another exercise - anything to continually shock the muscles. If there is unusual persistent pain, consulting with a doctor would be the best thing you could do. The Medical Departures link below will let you find the best and affordable doctors in the field. Find one now! Thanx Lene. The wrist has recovered well and I'm back to my usual fitness routine. Have you had the knee checked? I might seriously consider exercising. Just can't decide whether running or if biking will do. Having had knee tendinitis for the longest time, my suggestion is exercises that have low to no jarring impact on the knees. Biking may be a good candidate. Good luck. how months did u took off from lifting hwavy weights?